This week’s Venue review is written by Disneymooner Dereka. To read more about her wedding and read her recaps, please go to our private forums. If you’re looking for a reception venue that finds itself among the hustle-and-bustle of a 1940’s Atlantic City seashore, look no further than those at Disney’s Boardwalk Resort. Rooms are available for both large and small parties. The beautiful St. James room seating up to 100 people has an additional benefit-you can have your cocktail party outside on the patio. 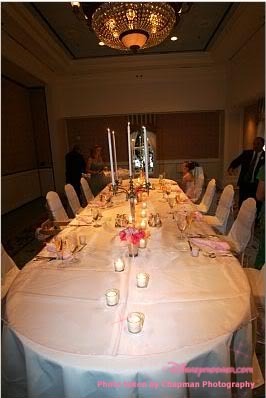 My own wedding was located in the Marvin Gardens room, which is slightly smaller than the St. James’ room, but these rooms can get split into three separate sections and Marvin Garden’s room was perfect for our intimate group of 10 people. The ballrooms at the Boardwalk are a soft pink, which may or may not enhance your decor. It worked perfectly with the pink-and-silver theme that I used. All the ballrooms at this location are very close to The Boardwalk itself and a reason that many brides choose this location. There are many fun & unique photo options available! The Boardwalk Resort is also right next to the beautiful Sea Breeze point, which could cut down on your transportation costs as your guests can walk directly from the ceremony to the reception. Imagine the look on your guests faces when they see Cinderella’s carriage coming around Crescent Lake! Did you choose The Boardwalk for your wedding reception? What rooms did you use? We’d love to hear from you. 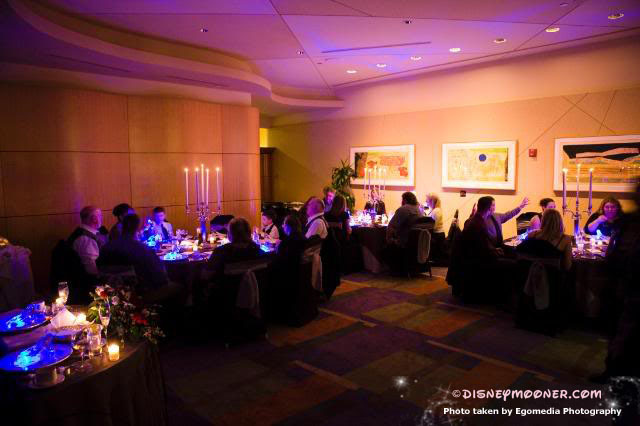 This week’s Featured Venue post includes images from Disneymooner Jill’s Napa Room reception, from her Photographer Egomedia Photography. 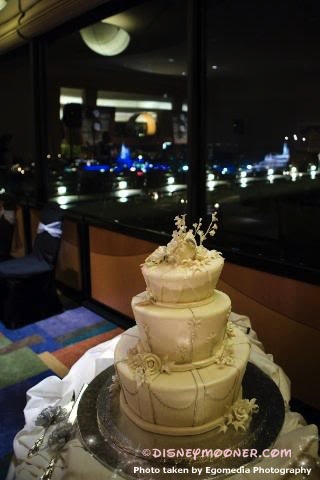 The California Grill, located at the top of Disney’s Contemporary Resort is a great choice for a bride and groom who want incredible views of along with top-notch cuisine. 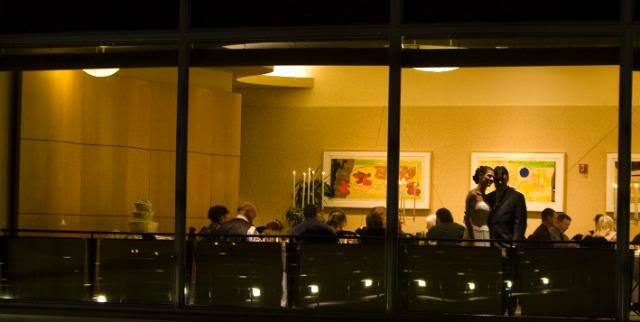 See our recent venue review of the main dining room reception. Receptions in the main dining room must end before 3 p.m., however couples wanting an evening reception can utilize one of the restaurants two other private rooms. 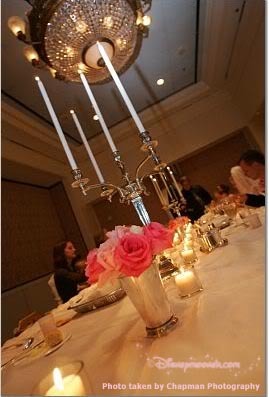 The Napa Room and Sonoma room offer secondary options for brides and grooms interested in this captivating venue. The Napa Room seats 50 and has a view of the Magic Kingdom. The Napa room can be used for morning or evening receptions and events starting after 4:00p.m. will have a higher food and beverage minimum. One of the greatest aspects of using the Napa Room for and veining reception is a private show of Wishes fireworks show at the Magic Kingdom. If timed correctly, you and your guests could see a one of a kind view of this incredible fireworks display. The Sonoma Room is a great location for the cocktail area for Napa Room events, or even for those weddings with a smaller guests list. The Sonoma Room seats 40 guests and has a wonderful view of Bay Lake. Even though the room does not offer a view of the Magic Kingdom, guests and couples cold use the walk way from California Grill to see the fireworks display. Brides and Grooms wanting to use this venue should consult their planner regarding which room and time frame will work best for their event. See what Disneymooners are saying about the Napa and Sonoma Rooms at The California Grill on our private forums. Please check out our latest Featured Venue Friday Reviews as well. My husband and I knew that we wanted to celebrate our fifth anniversary in Disney and knew we wanted to do something different. We had celebrated the event in other ways over the years but wanted to mark this occasion differently. We were discussing our various options for dessert parties, private dining, and cruises when a very “Grand” idea popped into our heads. As Disney Vacation Club Members at Bay Lake Tower, we had always wanted a reason to stay in a villa with a Magic Kingdom view. We thought what better reason than our anniversary to book a Three Bedroom Grand Villa and invite our friends and family to join us. The real planning began with a phone call to conventions at The Contemporary Resort and I was met with very helpful cast member who quickly directed me to Randy Ramos at Contemporary Private Dining. Randy was extremely helpful and a pleasure to work with while planning our anniversary. We emailed and spoke for several months leading up to our July trip. He would often email me late at night when I had questions regarding the menu. I explained that we wanted private dining to cater an event in our room, for around 20 guests. 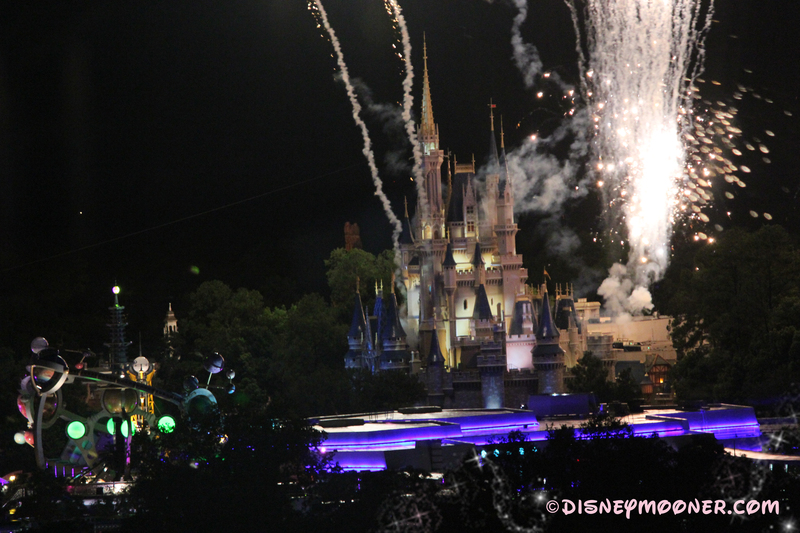 We would be inviting our guests to our room to watch Wishes, as a sort of in house fireworks viewing. Randy emailed menus back and forth to me and in the end we created a customized menu based on what we wanted to serve and what was in our budget. 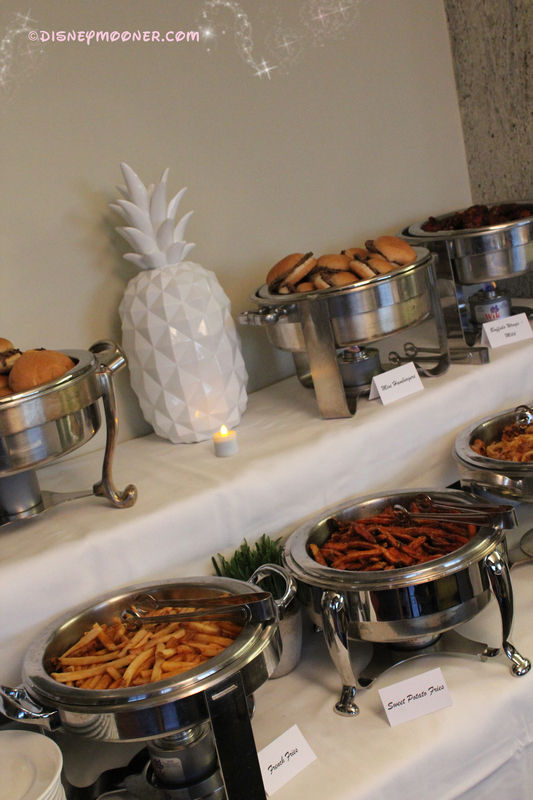 It was very easy to plan and the catering team was very accommodating. 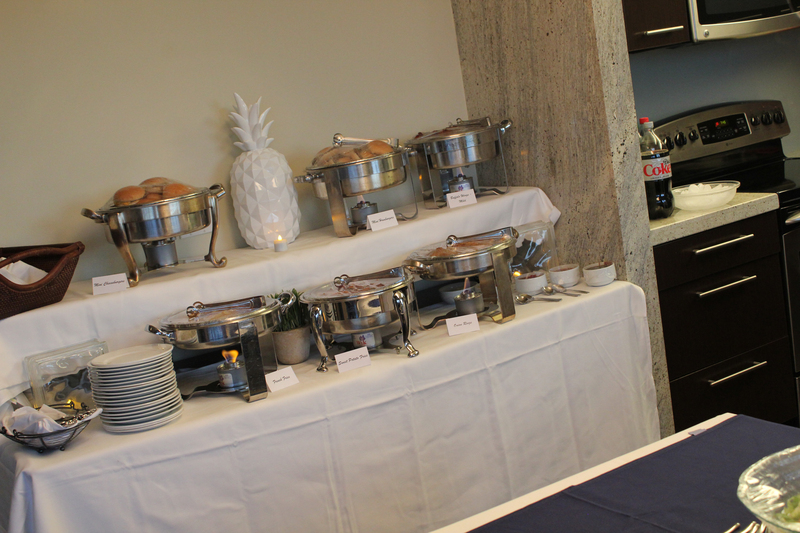 On the day of our event, Randy and his team met us in the room, to discuss set up of the food. It was all together very professional and they really made us feel like our event was special. An hour before our guests arrived, catering came to set-up the villa. We were shocked by the level, to which they set up the space. We had only expected the food to be delivered to the room. The catering team brought in a buffet table, special linens, serving platters and utensils, candles and other decorative elements. The food was delivered and set up and at the end of the evening the team arrived again to clean up for us. We were really pleased with the private event team and highly recommend them. The pricing and food were reasonable and the quality of the food was excellent. Hosting our event in our villa meant that we saved a great deal of money. Having planned other anniversary events in the past, this was by far the cheapest alternative. We had no viewing fees, site fees, or special delivery fees that are often associated with in park events. Most importantly we were under no time restraint. It was our room and we could hang out and relax for as long as we wanted with our guests. It was really nice to sit back and watch Wishes from our living room, with our friends and family, and not have to fight any crowds to leave a park at the end of the night. For a detailed budget and more images please check out the Disneymooners Forums. I’ve also planned several other events with reviews as well. DFTW Update: Booking a Disney Wedding? For Wishes Weddings, future Disney Brides can only call Disney Fairytale Weddings (DFTW) 16 months out, if you call before this date they will ask you to call back. I myself wasn’t aware of this new policy but apparently it changed at the same time Disney changed the booking and contracting timeframe to 12 months. For Escape weddings you can call 12 months in advance with bookings made an 8 months in advance. Is this a timeframe you can work with? We would be interested to hear from future Disney Brides what you think either here on our blog or on our forums. Disneymooner Sally, and her fiance Scott, will be having a Wishes wedding on January 7th, 2013 at Disney’s Wedding Pavilion at the Walt Disney World Resort. 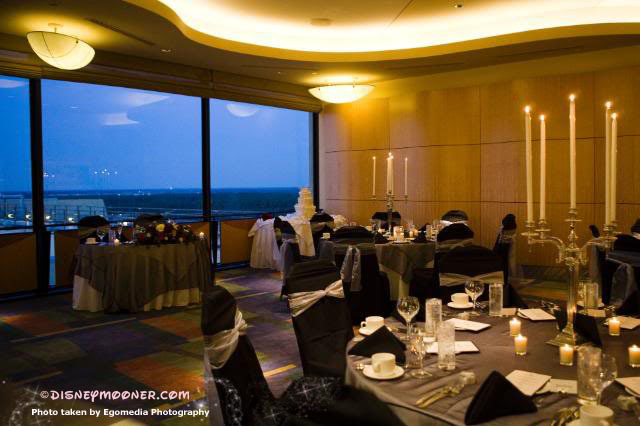 They will be having their reception at one of the Boardwalk ballrooms. Disneymooners: Can you tell our new members a little about the both of you? Sally: Scott and I met and began dating while working at our former employer. Scott manages a team responsible for the email and collaboration system at a large University, and I’m a Sr. IT Associate at a financial services company. We’ve been together just over 8 years, and have been engaged for a little over a year now. 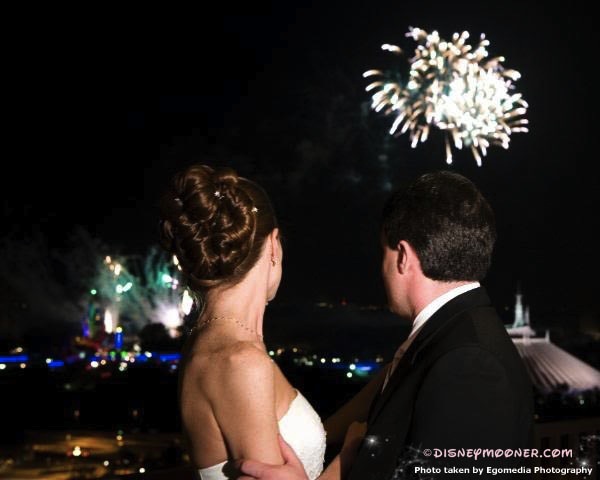 Disneymooners: When did you first decide you wanted to have a Disney Fairy Tale Wedding and why? Sally: Disney was our first vacation together, and has become a place we go back to every year. 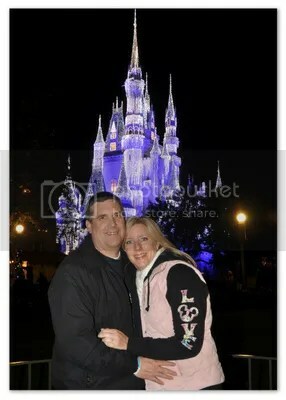 We decided Disney would be where we marry after Scott proposed at Disney. I thought it was a trip to celebrate my birthday and see the Holiday decorations, but Scott surprised me with a romantic proposal on our first night during dinner at Victoria & Albert’s. I also have to add that the most special part of the engagement was when Scott told me he had asked my father for permission to marry me. My father was ill and unfortunately he passed away a month after Scott asked him. While I never got to share the exciting news with him personally, knowing that my Dad knew was very special to me. Disneymooners:Did you have any concerns about having a destination wedding? If so, what were they and how did you work them out? Sally: No concerns whatsoever. I knew that a majority of our guests had never been to Disney, so they will use the wedding as a good reason to finally plan a vacation for our event. Disneymooners:Any special reason why you chose these locations? Sally: Whenever we rode the monorail, I would always look at the Pavillion and imagined how special it would be to get married there. While we were at Disney during our engagement vacation, I was lucky to get an appointment to meet with a consultant and see the inside of the Wedding Pavillion. I knew as soon as I walked in, that was it. For the reception, we originally planned to have it at the Napa Room at California Grille, but it is going under refurbishment on January 1st,, 2013, so we chose the Boardwalk because we love the location and atmosphere. Disneymooners: Many brides pick a Top 3. These are components that are a non-negotiable. Chiavari chairs, lots of floral, lobster, etc. Tell us about your Top 3! Disneymooners: Do you have any extra magical touches planned? Such as a dessert party or characters? Sally: We are planning a dessert party at Italy Isola West as the welcome party the night before the wedding. One of the advantages of being a member on the Disneymooner site is all of the good information posted by past brides – specifically Glad I Did, Wish I Had. A consistent message I read was “glad I had a dessert party” and “it is so unique to Disney”. I may never get another opportunity to have all of my extended family together again, so this is going to happen! We’re also going to have an “Around the World” pub crawl at EPCOT complete with passports. Each guest will have their passport stamped as we visit each country and sample the beverage of choice! Disneymooners: What would you say has been your biggest challenge? Sally: It hasn’t been too much of a challenge, but planning the wedding from a distance. I know that will pass when I get to Florida in June and meet with my planner, plus there is plenty of information available on Disneymooner’s and the internet. Disneymooners: Budgets are very important to all of us. Do you have a favorite budget tip that you’ve used and can you tell how it’s helped you? Sally: Yes, I have 2 tips. The first, if you are creative enough or have a vision and can DIY some things, do it. I DIY’d my Save the Date’s and saved approximately $250! My second tip would be to get the Passporter’s Disney Weddings & Honeymoon book. It has all of the budget worksheets you need, and if you buy the ebook version, you can enter and track your expenditures in the program and how much you will owe, including what is service charged, taxed or both. Disneymooners: Have you found it to be easy to plan a Disney Fairy Tale Wedding on your planned budget? Sally: Yes, I compared the Disney minimums to other local and destination venues and Disney’s costs were coming out on par or better. But, no other venue can offer all of the amenities that come built-in with a Disney wedding, so I feel it is very worth it. Disneymooners: Do you have any fun splurges planned for your trip that you’re excited about? Sally: Well besides the “around the world” afternoon at EPCOT, the guys are going to have a golf outing and I would love to have a bridal tea, but that has not been planned yet. I’m going to work with my planner on coming up with a girls event. Disneymooners: You have a Planning Journal in progress on our forums, have you found that to be helpful in your journey? Sally: Yes, it’s been great to have a support system to give you words of encouragement, bounce off an idea and get feedback, or ooh and ahh over a choice you’ve made. 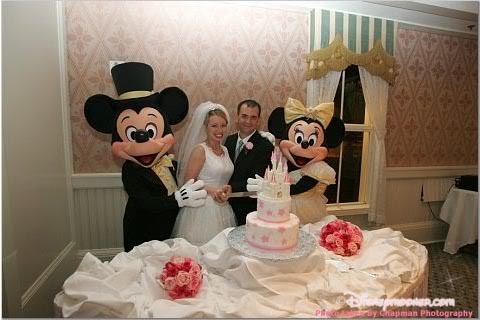 It’s clear that people come to Disneymooner to get ideas and inspirations for their wedding, but then stay on long after their wedding is over because they’ve made connections with other members. Disneymooners: What are you most looking forward to on the big day? Sally: Besides the obvious of finally making our relationship official?! I’m looking forward to waking up that morning knowing that it is finally my wedding day and having that quiet time before the chaos of getting ready begins. And selfishly, I’m also looking forward to all of the fuss with hair and makeup, and then putting on my gown and feeling like it’s my Cinderella moment! Disneymooners: Do you have anything else you’d like to share with our new members? Sally: I’ve learned some great tips and ideas that have helped me in my planning by joining Disneymooners. Being long distance, I’ve also used Google to get other brides feedback on various vendors – I’ve found great feedback at weddingwire .com. Lastly, good luck with your plans and I hope your wedding turns out to be everything you wish for! Sally, on behalf of all of us, I’d like to thank you for taking the time to share your experiences so far. We are so happy you have joined Disneymooners and we are so excited to follow your planning. Wishing you a wonderful planning journey and a beautiful wedding next year! All the best ~ Disneymooners. Your Fairytale Wedding is not affiliated with, authorized or endorsed by, or in any way officially connected with; The Walt Disney Company, Disney Enterprises, Inc., or any of their affiliates.